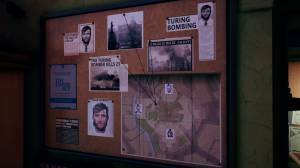 The Occupaton is a first-person 'politically-driven' narrative game where you play as a journalist in 1987 England who has to search for the truth behind a terrorist bombing. The story starts with a terrorist attack which kills 23 civilians. In response the UK goes the same route as many modern countries, creating the Union Act, a sweeping piece of legislation that tramples over existing privacy laws and threatens the foundations of democracy. The entire story plays out over the course of four real-time hours in a single government building and you either get to the truth and become a whisle blower, or the government will pass a restrictive new set of laws unopposed. If you need to think about anything at any time during the game you can always pause time using the 'Options' menu. It is advised that you keep the subtitles enabled so that you are made more aware of environmental cues. This includes things such as guards discovering your positon or leaving an area. When you get caught being somewhere that you are not supposed to be and don't vacate immediately you will be given a warning. If you leave immediately, more often than not you will be let off the hook. If however you are caught three times you will be removed from the area and continue on to the next area and it will prevent you from getting the 'best' outcome. Remember that you can always store things in your briefcase simply by opening it. If you enter Charles Bowmen's office through the vent in the store room a safe can be found before coming out behind a pinboard in the office. The safe's code is the same as the door code: 5959. To avoid the security guard Steve Crow when the alarm is triggered after inserting the Silhouette Disk into the server you need to go upstairs or into the vent system above Dubois' workshop, which links to the central area upstairs. Found in the safe behind Charles Bowman's office. When you reach the bottom floor, you can duck under a barrier and find the vinyl propped against a blackboard. The floppy disk named 'Trapdoor' that is in the package that is slid under the front door can be inserted into the floppy drive of your PC and the program can be run. You can fix a corrupt floppy disk using the Data Doctor in the Lost Property. The email Alex sends to Carla which proves his innocense can be found either in Dubois' PC or in the deleted emails on Carla's PC. The password for Carla's PC is geo. You will find an empty floppy disk next to the PC which you can copy the email from her deleted emails onto and then print from at the public printer with one token. You will not be able to enter Debbie's office via the vent as it has a lock on it. You can enter it by turnng off the power to her room. Doing this however makes accessing her PC harder. The message recording which proves Alex Dubois' innocence can be found in Carla Burman's safe locker which can be found in the storage room which can be accessed by a vent above it. There are several tape players, the easiest one to get is the one in the attic which can be accessed using the scaffolding. 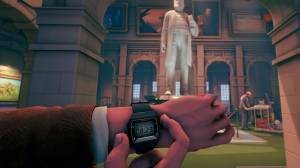 Check out our Video Walkthrough Guide page if you need more help on any of the different scenarios in the game. Check out our Achievements and Trophies page to find out how to earn them. No discussions open for The Occupation at the moment.